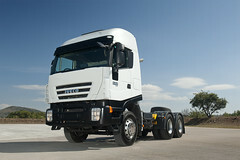 All Euro5 versions are available automated transmission AGile ™ 6-speed and reverse. Change AGile™ choosing the right gear according to the route and the load, thus reducing the fatigue of the driver, optimising fuel consumption and reducing component wear. The electronic controls, in fact, prevent the "over-revving" so fewer demands on the engine are placed and thus ensures a longer life. Change AGile™ also analyzes the pressure on the accelerator pedal, and adapts its response to the driving style of the driver. It is used both in automatic mode, in either sequenziale.